Would you like fuller lips? Are you tired of trying to make them look bigger with lip liner or lipstick? 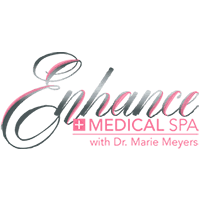 Dr. Marie Meyers at Enhance Medical Spa in Cincinnati is an expert at adding natural-looking fullness to your lips. To learn more about lip fillers, call the office or book online. Fillers are safe gel-like compounds made from hyaluronic acid, a substance already present in your skin that promotes moisture retention. Dr. Meyers uses Juvederm, the most popular filler in the country. Lip filler lasts up to a year, but even once the filler is gone you will retain the new collagen which has formed around it. Lip fillers are injected with a tiny needle and contain the numbing medicine Lidocaine to minimize discomfort. The area is then gently massaged to ensure a natural look and feel. Results are visible immediately, and there is no downtime. Why should I come to Enhance for lip fillers? Everyone has seen examples of overdone “duck lips” where people look weird rather than wonderful. Dr. Meyers is one of the best injectors in the area, and is unusually talented at achieving naturally full lips. She goes slowly, with feedback from you during the treatment so that you get the exact look you want. Patients are thrilled with the results. Call Enhance Medical Spa today or book online, and get ready to love your lips.